eShop Hosts are pleased to announce the launch of the All In One eCommerce Hosting Package, a new and comprehensive, feature packed hosting solution for e-commerce websites. The All In One eCommerce hosting plans are now available and include everything online shops require for secure online trading such as one years web hosting, one years domain registration, one years dedicated IP address and SSL certificate from the well known and recognised Comodo SSL certificate provider. The All In One eCommerce Hosting plans also come with full support from trained and experienced ecommerce support staff who will install your preferred Shopping Cart software along with any modules and templates you require to and offer you advice and guidance to get your online shop up and running through our ‘Live Support’ facility. The total value of the Domain Registration, Web Hosting for a year, dedicated IP address and installed Comodo SSL certificate based on our usual pricing is £99 for the Single Site package and £123 for the Starter Plan so the savings are more than a massive 30% off regular pricing. Two different All In One eCommerce Hosting Plans available to choose from with different server allowances. Each hosting plan has different Server allowances to suit different requirements. Both hosting plans come with the industry leader cPanel hosting control panel which means configuring and setting up your website, emails back-ups and a whole host of other day to day hosting related tasks simple and quick. 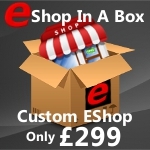 With the sHop Hosts All In One eCommerce Hosting Package you can choose from a variety of domain name extensions like .COM, .CO.UK, .NET, .CO, .EU and register the available domain name you want to use for your online shop FREE for 1 year. with No catches! The domain will be registered in your details, under your complete control and will also cost nothing to renew for the duration of the All In One eCommerce Hosting Plan. With the sHop Hosts All In One eCommerce Hosting Package you can secure your website with an SSL certificate from one of the most recognised and trusted SSL Suppliers. Give your website vistors the trust and confidence to make purchases on your website meaning you make more sales and repeat business. Usual cost of a dedicated IP Address and Comodo SSL cerificate is over £50 plus installation costs but is included FREE within our All In One eCommerce Hosting Package. All hosting clients of eShop Hosts benefit from our Live Support where our experienced e-commerce advisors help and guide our clients, not only on hosting related issues but also shopping cart configuration and set up as well as template and module installations too. So if you are looking for a web hosting company to host your ecommerce website then look no further, you have found the web host you are looking for.